Jain snack recipes. Jain Naashta. Life without snacks would be real boring. They make a party snazzy, help beat sudden hunger strikes and always make tea-time more interesting. Working within the rules of Jainism, it is possible to make scrumptious snacks too. From simple Indian recipes like Chana Dal Seekh Kebab recipe to more international recipes like Capsicum Rings, there are plenty recipes to choose from. Perfect Chana Dal Seekh Kebab, made with the ideal proportions of chana dal, raw banana and chopped cabbage, excitingly flavored with mint, green chillies and spice powders, can be served as a starter or as an accompaniment to tea while these Capsicum Rings are made by deep-frying capsicum rings coated with a plain flour batter that is aptly perked up with black pepper. Many street food recipes are laden with onions, potatoes and garlic but there are many that can be had by Jains. By a simple substitution of potatoes with raw bananas, you can make impressive Jain recipes and you won't even realize the absence of potatoes! Jain Vada Pav – Probably the most famous jain street food, this recioe is made without any ginger and potatoes but instead uses raw bananas that are boiled. The taste is so good, that you wont even realize this recipe is jain. Khandvi – This Gujarati street food is loved by all. Thin rolls made with a besan and curd batter, tempered with mustard seeds and topped with coconut are the perfect snack or breakfast! Mini Cheese Uttapa - A simple topping of cheese and green chillies transforms uttapa into a delicious treat! No Indian can live without his own stash of dry snacks, whether it is kachoris or shakarpara. These next few jain snack recipes are very mouth-watering and will tempt jains and non-jains alike! Baked Chaklis – These simple chaklis are the much healthier version of their deep-fried variant and are made with ingredients that are easily available in every Indian household like rice flour, sesame seeds and curd. Papad Poha - Papad Poha is a unique combination of roasted poha and crushed papad seasoned simply but effectively with a dash of salt and sugar. Corn Croquettes – these golden beauties are made with leftover rice, corn, butter and breadcrumbs that give them a crispy texture. 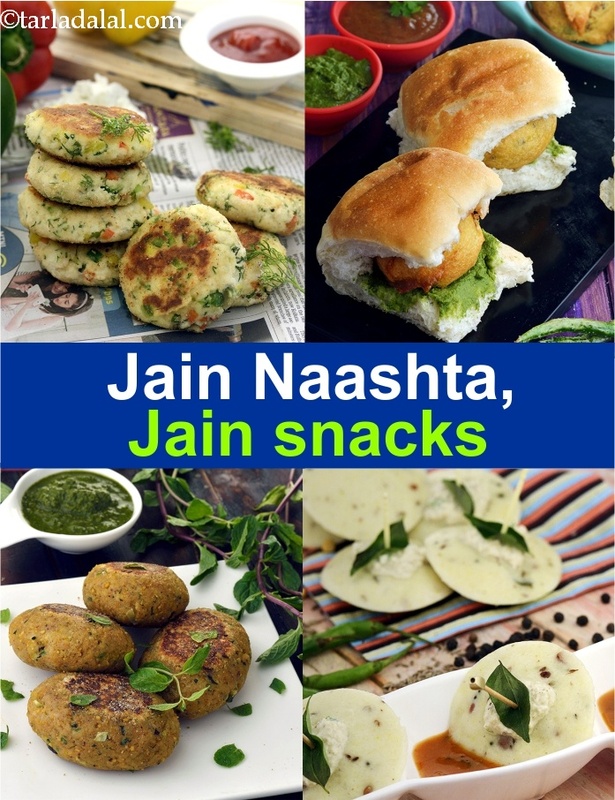 Enjoy our Jain snack recipes. Jain Naashta and other Jain Recipe articles from Jain Subzis to Jain International Recipes. A cheese dip delicately flavoured with capsicum and mustard. This creamy dip compliments beautifully with most deep fried starters like wafers, nachos, bread pieces, croquettes etc. Delightfully easy but very tasty pancakes. Serve these Jaggery Pancakes straight from the pan onto serving plates. Green chilli paste and jaggery give a new spicy sweet taste to this recipe. Add a little more flour, if you find the pancake difficult to make.